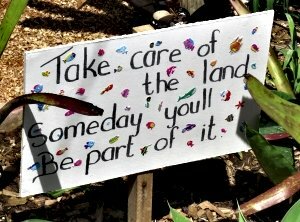 Today, the general public are fortunate in being able to discover the forest, this rare and one-of a kind indigenous forest in South Africa that stretches the length of the garden route in broken patches. They have easy access to them by way of well set out foot paths, cycle trails and picnic areas. Visitors to Sedgefield are in the enviable position of being within easy reach of some of these most beautiful forest areas. 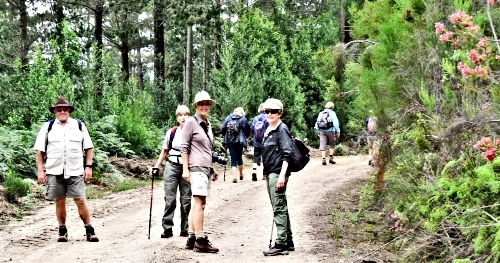 To the west, towards Wilderness and George and then inland towards the Outeniqua mountains, are the “Groeneweide” forest trails. 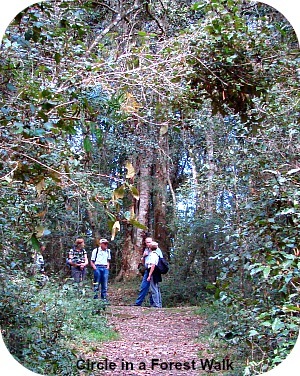 To the east, and inland towards the foothills of the Outeniqua Mountains is the Gouna forest incorporating Millwood and the old gold diggings around Jubilee Creek. 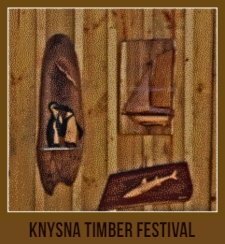 East of Knysna is another large forest area: Diepwalle, and still further east are the Tsitsikamma forests inland from Storms River. All these areas are accessible and are well traversed by walking trails of varying distances requiring different degrees of fitness. It's advisable to take a hat, wear comfortable clothes and strong shoes or hiking boots. 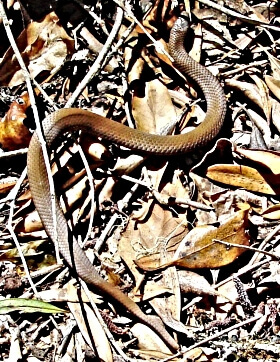 Snakes are present although they are not aggressive and usually retreat from human sound. Take water, something to snack on, binoculars, camera, your cell phone. It is advisable not to walk alone. Red Elephant Walk is on my website. 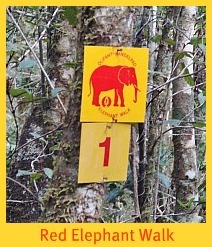 It is one of 4 forest elephant walks. SANParks and Cape Nature have maps of all their walks and you need to sign in at their offices and pay a fee to do the trails. 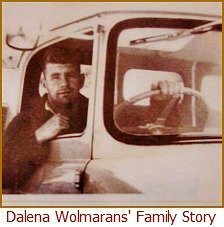 The Big Outeniqua Yellowwood where Dalene Matthee's grave is. It is the beginning of the Circles in a Forest trail. 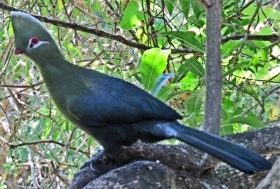 Being able to identify some flora and fauna of indigenous forests can only increase your pleasure of the experience. 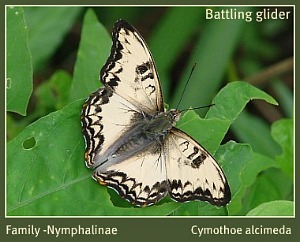 It is not as difficult to identify these things as is often imagined, so a few of them are mentioned here. With trees, the three things to look at are, the leaves and bark, and if possible the fruit or flowers. The leaves can be out of reach so the bark, which you can see and touch and the flowers or fruit are often are easier to identify the tree by. To begin with as one approaches the Gouna Forest along the Rheenendal road, one can spot a single tree that stands above all the rest high on a ridge. 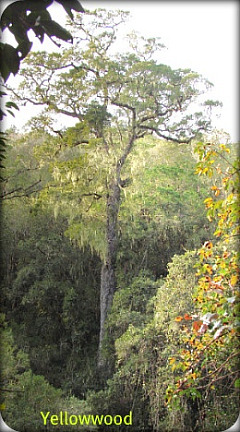 This is a Yellowwood – Podocarpus falcatus. Once you are in the forest the road will lead you right to it. Local author, Dalene Matthee’s grave is at the foot of this tree and it is the start of the walk called “Circles in a Forest” after the name of her popular book. Yellowwoods: There are many yellowwood species throughout the world, but there are only four here in South Africa. 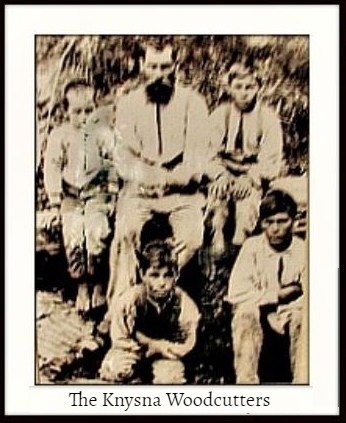 The family’s botanical name is very interesting. It is,“podocarpus”.This means, “foot fruit”. The reason for this is that most, but not all the family members have very strange fruit, the seed being, not inside the fruit, as in a peach or a plumb, but on the outside of the fruit. Hence, the seed looks like a little foot. The “Big Tree” is one of the exceptions to this rule, the seed being inside the fruit. These trees take 200 years to mature and some of these majestic matriarchs have graced the forest for over 800 years. Even two hundred years ago, they were too big for the woodcutters of those days to tackle. 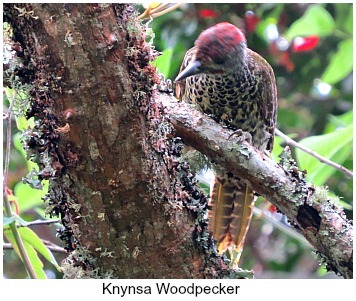 Unfortunately there are several common names given to this species: The Big Tree, the Outeniqua, the Knysna and also the name “Kalander” that is said to be short for “Outeniqualander”. 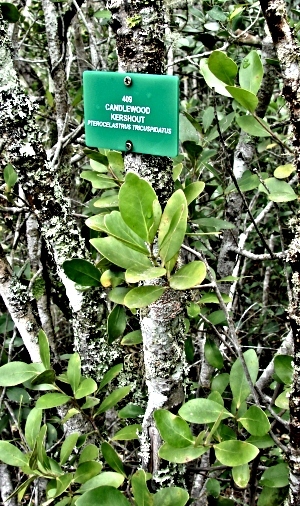 Stinkwood: This beautiful tree has a “not very beautiful name”! The word, “stink” in English, indicates a bad smell, but in truth it just has a noticeably pungent smell. When a tree is newly felled, the heartwood, which is darker in colour than the sapwood, smells. Once the timber dries out, this smell goes. Stinkwood is only found in South Africa and is one of the most excellent and highly sought after woods for furniture making and hence very expensive. From seed a tree takes 300-400 years to reach maturity. 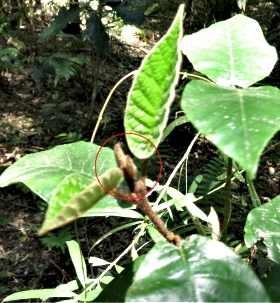 The stinkwood is particularly easy to recognise, if the leaves are within reach. It is a species that coppices, i.e. trees are multi-stemmed and often produce new shoots low down and within easy reach. 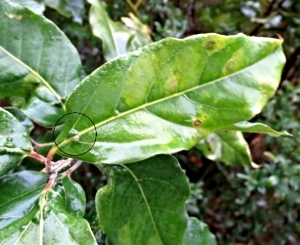 New leaves are light green or reddish in colour and these darken with age becoming dark green. 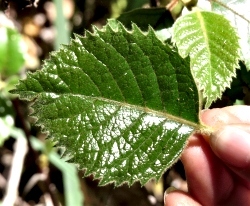 The most obvious characteristic is small pocks found in the angle of the veins of the leaves, usually in the angle between the central vein and the first, and maybe second, lateral veins. These small pocks are convex on the upper side of the leaf and concave underneath. They are called, “bullata”, meaning little bubble, hence the botanical name, Ocotea bullata, and belong to the laurel family. The bark has patches of colour – light grey, mauve and orange, and is fairly smooth apart from traverse ridges and very small lumps – enlarged lenticels, the breathing pores of bark. Candlewood Pterocelastrus tricuspidatus The leaves can be folded in half and break straight across with an audible snap.Twigs and roots were used to make torches hence its name and it also made good firewood. 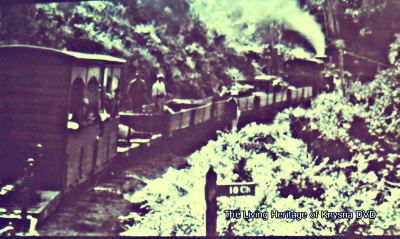 The wood which is very hard and heavy has a rose-red to dark red colour and was used to make furniture and flooring. Black Ironwood Olea capensis subs. macrocarpa, a member of the large Olive family, this tree has fruit sought after by the forest animals and birds so the oblong fleshy purple fruit about 20mm long will help you identify it when it is fruiting between April and August. 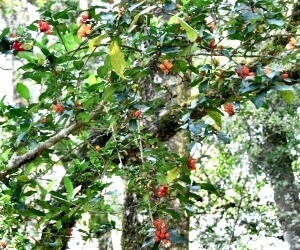 Saffron: the False Saffron Cassine peragua is common in coastal forests as is the Climbing Saffron – a creeper version. The Common Saffron Elaeodendron croceum is found in the wetter real forests as opposed to the Dune (coastal) forest. 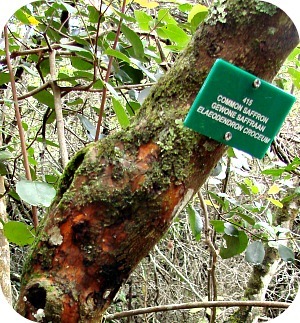 It’s named because the colour under the bark is a rich yellow. The leaves are very palatable to bushbuck and other browsers so the leaves are prickly when the tree is young but as it grows they lose their sharp teeth! The expensive culinary saffron comes from a little bulbous plant found in the Middle East and Southern Europe. N.B.You will notice at times, some trees that are numbered. If you make a note of them, you can look them up later in a reference book. Wild Pomegranate Burchinellia bubalina The Zulu name for it means 'Bird's liquor' and justly so because birds love the copious nectar they find in the dense orange-red tubular flowers which is what make this tree easily recognisable when it is in bloom between September and December. Cape-hazel (Onderbos)The top showing the two little furry rabbit's feet help to identify it. The undergrowth is also governed by the amount of moisture available. For example, the Cape Hazel (family of witch-hazel) or ”onderbos” grows well on drier ground. 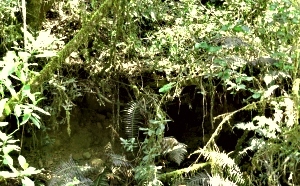 Tree ferns and many mosses enjoy wetter situations. 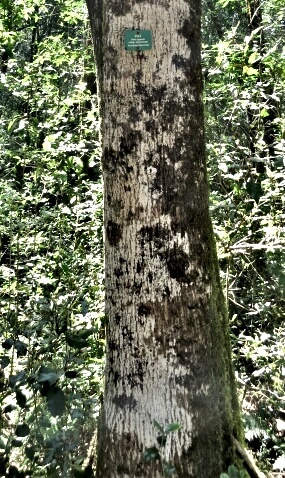 Many lichens hug the bark of trees forming intricately delicate patterns. Theirs is a symbiosis between algae and fungi. Their role in the scheme of things is not fully understood but the presence of "Old Man's Beard" is taken as an indication that the air is clean and unpolluted. The Ramora fern, or “seven week fern” is more versatile. It has this common name because, if cut and treated correctly, it will last for seven weeks, and is therefore used in floral decorations and exported abroad. Others are the Knysna fern and Carrot fern. 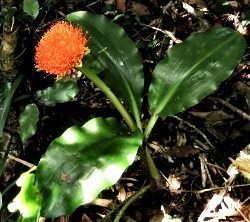 In Spring and early summer look out for the striking Paintbrush Lily-Scadoxus puniceus along the forest pathways. Arum Lilies thrive in moist conditions next to streams, in patches of sunlight, and similarly bulbous plants like forest bluebells and Wild Irises brighten paths with bursts of colour. 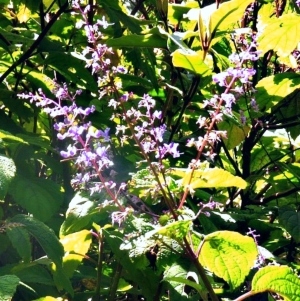 The prolific Plectranthus that grows easily in gardens, was first discovered in its shady forest home and has different varieties ranging from large shrubs to small plants in varying shades of lilac . 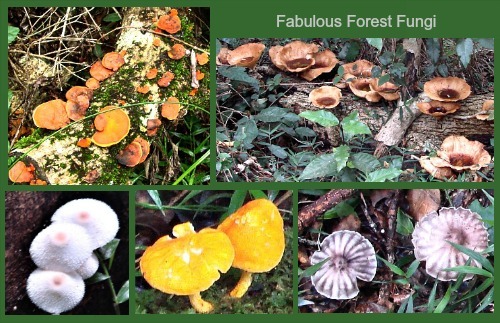 I find the plethora of forest fungi intriguing and stunningly beautiful. The variety never ceases to amaze me. Some kinds are only found on rotting fallen trees and others only grow on living trees. They have intriguing shapes, some look like intricate flowers, some are like funnels holding water, some look like beach umbrellas and many are multi-coloured! They play an important part in recycling forest litter. 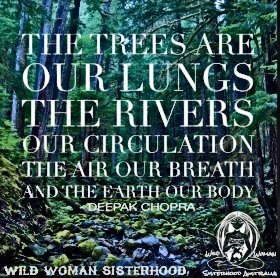 So don’t rush past just looking at the ground in front of you - discover the forest components that make an indigenous forest such a special place.! 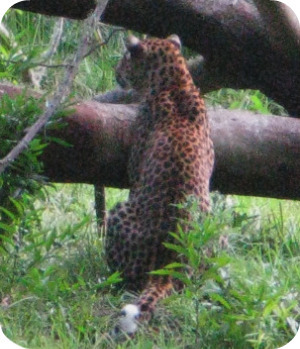 Forest animals are seldom seen because of the dense vegetation and because many of them are nocturnal. However, they are there! Elephants! 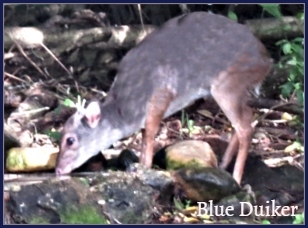 There are two notable predators, the leopard and the caracal; two antelope, the bushbuck, which is fairly common, and may be seen during the day, and the very rare and secretive little blue duiker, now hardly ever seen. 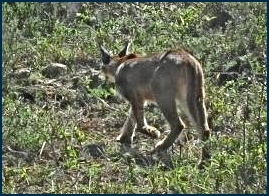 They are hunted by raptors, predators and poachers. Bushpig are quite common in indigenous forests, but their spoor and droppings are usually all that indicate their presence. If they are seen during the day, it should be remembered that they are quite temperamental and can be aggressive. Baboons and monkeys are often seen and you are likely to come across their droppings. 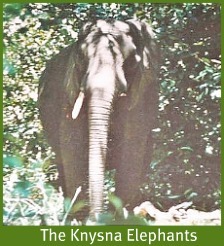 In most instances they keep their distance and you will hear them noisily retreating into the forest away from the paths and your presence. Honey badgers and porcupines also forage in the forest but you would be very fortunate to even catch a glimpse them. 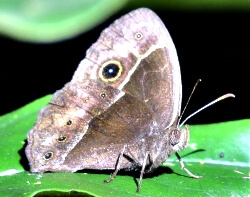 Easier to see are butterflies although they fly away sometimes too fast to be identified. 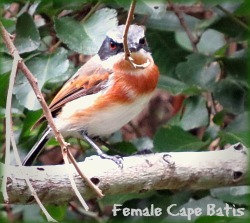 I got a good photo of this Battling glider that prefers the wetter indigenous forests of the Cape region. 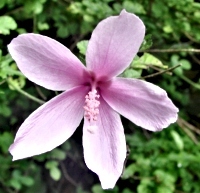 The larval host plant is the Wild Peach Kiggelaria africana found in the Knysna forests. 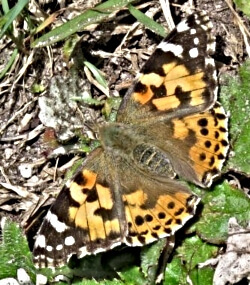 The butterfly feeds on damp patches of soil next to the road which is where I saw it. 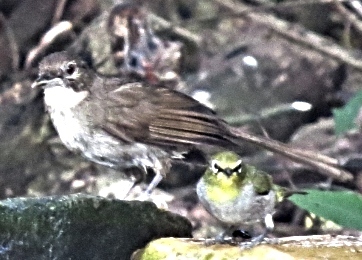 They are shy and easily disturbed so I feel lucky to get a photo of it. I was also fortunate enough to come across a spider wasp with its prey - just as well otherwise I certainly wouldn't have known it was a spider wasp! These wasps hunt spiders exclusively. 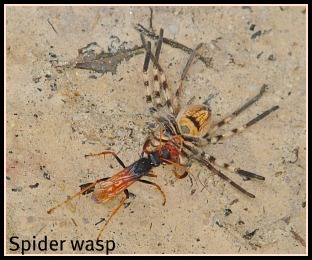 You can see the spider is bigger than the wasp and it doesn't give up without a fight. Unless it gets away, the wasp paralyzes it by stinging it in a specific nerve centre and then implants an egg in its victim which becomes food for the hatched larva! 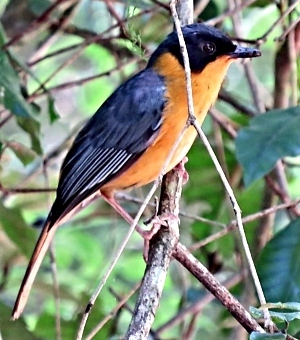 Although birds are abundant in indigenous forests, they are difficult to spot because of the dense vegetation. 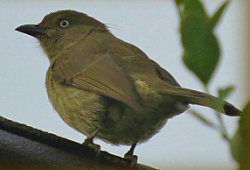 Sometimes however, their calls give them away like the noisy calling of the Knysna Turaco, tsping sunbirds, melodic Cape Robins, Southern Boubous and Sombre Greenbuls (wee willie willie call). 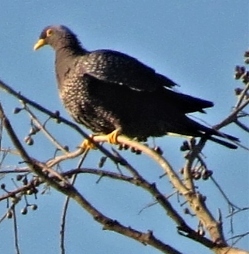 Raptors, particularly the Forest Buzzards – are fairly common and easy to see, mostly solitary – soaring in the sky as you walk through forest clearings. 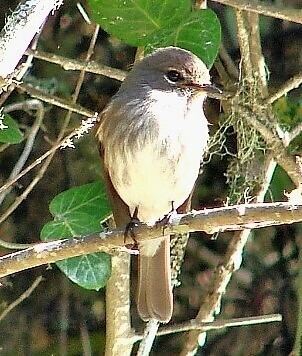 The silent Narina Trogons, furtive flycatchers, and secretive Cape Batises are much more difficult. A walk in the indigenous forests on a lovely summer’s day where you can appreciate nature’s intricate kaleidoscope of colours and creatures and plants and cool streams (eg. 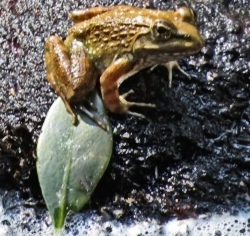 a number of different frogs can easily be spotted in the shallow stream that runs through the Jubilee Creek picnic site) and sweet birdsong is an uplifting and revitalising experience. One has to take it slowly, stop and look, stop and listen. You should do it this way because you have to keep your eye on the path when you're walking so without realising it, you can miss alot. Try a walk in our indigenous forests and discover the forest magic - if you have never done a walk in it before – it will help you to see your life differently! Affordable and multi-award-winning self-catering cottages where you can experience TRANQUILITY, PRIVACY & ROMANCE. Break away to this nature-lovers' retreat: secluded cola-coloured rock pools, forest walks, biking trails. Sway away your cares in a hammock, have sundowners with the fireflies or cuddle up to cosy fireplaces. 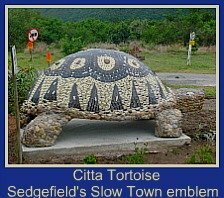 Reasonably priced 2-bedroom self-catering cottage holiday accommodation nestling in the Indigenous Knysna Forest, Garden Route, Western Cape: an authentic self-catering vacation haven for nature-loving families, stressed-out city-dwellers, adventurers & honeymooners. Look out for these creatures as you walk in the Forest. It will also help you to learn these bird calls.